So I know what you are thinking = Frugal Bathing?? For Real? Yes – I thought I would post this as I know we are having massive drought and some counties in California are looking at losing their water in just 90 days. Also, I was shocked after learning of some family member’s water bill being $500/month in California. WOW!! Either way, I LOVE my hot showers and I also work in a profession that being clean is a necessity. So, once you are done boiling your water and pouring it into you pot, put a hot plate on the side of your tub before setting down the pot. 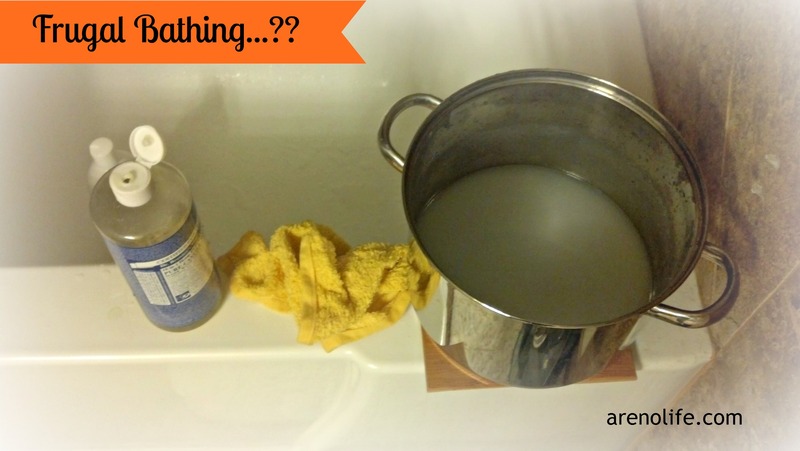 You can add cold water to the pot if the boiling water is TOO scalding. Now, get in your shower. Wet you face cloth, ring it out, put some castile soap on it and lather yourself from bottom-up (feet moving towards your neck). Do both sides. Now, rinse out your face cloth before dunking it back into your hot water and without ringing out it out, bring it up to your shoulders/neck and THEN RING OUT, so the water rinse your off. Put something warm on like a track suit or a fleece jump suit. Once done with your body, you can move onto your hair. I found this easiest by wetting my ends with cold water and then ringing out a face cloth when I got closer to my roots. Yup, like I said, I like my hot showers and don’t like the cold. Shampoo, then rinse out with the cold water under the faucet = I found easier to get it all out. Also I just kept the cold water away from my scalp. Next, condition your ends and rinse out with hot water. Lastly, I used the pot of hot water directly with the face cloth to wash my face. When done, I poured the remaining water in my pot down the shower drain.